The problem of Fragmentation: The continuous deleting and copying of files on the computer drive gives birth to the problem of Fragmentation. If there was only one partition on a 1TB disk, the fragmentation will scatter the fragments of files throughout the 1TB partition space, which means that in order to play that file, the software assigned to play it has to crawl all of the 1TB to completely load the file from all of its fragments. Imagine if the same file was placed in a 100GB partition instead; then the software has to crawl only 1/10th of total disk space this time to load that complete file; the time required to open that file also reduces drastically. This all results in a quicker hard disk response. Better Backups (and Cloning): Backup is the process of making a copy of your data. Having more than one partition lets you make separate backups for both types of data – Operating System and Program Files, and User files. So, if you want to create a backup of Windows files and all of the installed software then you only need to backup your C: drive. Similarly, if you want to create a backup of the user files, your personal files, then you can backup all of your drives except the C:. Windows Reinstallation: Having a dedicated Windows drive makes reinstalling Windows a lot easier. If your Windows is not working properly, and you want to reinstall it, or you want to perform an OS upgrade, then it would be better if your OS and Data were separate in separate drives. Multi-Boot: Having multiple partitions lets the user install and run multiple operating systems. You may be a regular user of Windows but have to use Linux for one particular software that is only available for Linux, and vice-versa. Drive Errors/System Crash: If your Windows partition encountered any type of error, and became inaccessible or unbootable, you will lose access to all of your files as well because they were also stored in the same partition. Malware Attack: Malware are created to do a specific task. There are different types of malware such Virus, Worms, Spyware, Ransomware, etc. Some malware can attack your hard disk partitions, and format them. The drive C: is the most obvious target of these malware. Limited Productivity/ Unorganized Data: Storing all kinds of files on the same partition can make it difficult to organize the data, which is one of the causes of limited productivity of the user. You can create multiple partitions to organize different types of data, such as one partition titled Work stores Work related documents, another titled Personal stores Personal files. Alternatively, you could make partitions for various types of files i.e., separate partitions for documents, music, video, and pictures. More control over Partitions: Even if you have already have multiple partitions on your disk, there may come a point in future when you have to perform certain partition related jobs such as resizing an existing partition, merging adjacent partitions, splitting one whole partition into multiple small ones, or extending partition into unallocated space. Partition managers give the user more control over his disk. Advanced Partitioning Features: With the third-party Partition Manager software, you can do all those things that the default Windows Disk Management tool does not let you do. These software also provide many advanced features such as copy or clone the whole partition, clone OS to another HDD or SSD, convert between GPT and MBR partition tables, convert file system between FAT and NTFS, etc. Additions Tools: The partition mangers also provide many additional tools as well that can perform various disk related functions such as checking disk and partitions for bad sectors and other errors, wipe partition, hide/unhide partition, surface test, change drive letters, set active partition, initialize a new disk, etc. Here are the Best Free Partition Managers for Windows. AOMEI is the most feature-rich free partition manager for Windows. The main disk management features include Create/Format/Delete Partition, Merge Partitions, Split Partition, Resize/Move Partition. It has various wizards that guide you through entire processes in step-by-step manner. These are Extend Partition Wizard, Copy Disk Wizard, Copy Partition Wizard, Partition Recovery Wizard, NTFS to FAT32 Converter, Partition Copy Wizard, Disk Copy Wizard, Convert Between GPT/MBR Data Disk, and SSD Secure Erase Wizard. Other disk related tools and utilities include Wipe Disk or Wipe Partition, Check Bad Sector, Check Partition, Change Drive Letter, Hide/Unhide Partition, Set Active Partition, Rebuild MBR, and Initialize Disk. Special utilities include Windows To Go Creator, Make Bootable Media, and Integrate to Recovery Environment. The Windows To Go Creator is used to create the portable version of the Windows 7, 8, 8.1, and 10 operating system. The Make Bootable Media lets you make bootable WinPE disks. Another interesting tool is the Integrate to Recovery Environment, which lets you integrate the AOMEI Partition Assistant and AOMEI Backupper into the recovery environment of the currently running operating system. The supported Windows versions are Windows 10, 8.1, 8, 7, Vista, XP, and 2000. The supported file systems are NTFS, FAT32/FAT16/FAT12, exFAT/ReFS, Ext2/Ext3/Ext4, and more. And, the supported storage devices are Hard Disc Drive (HDD), Solid State Drive (SSD), Solid State Hybrid Drive (SSHD), USB Flash Drives, Memory Cards, and other Windows recognised storage devices. It supports both GPT and MBR partition tables, and the UEFI/EFI boot. 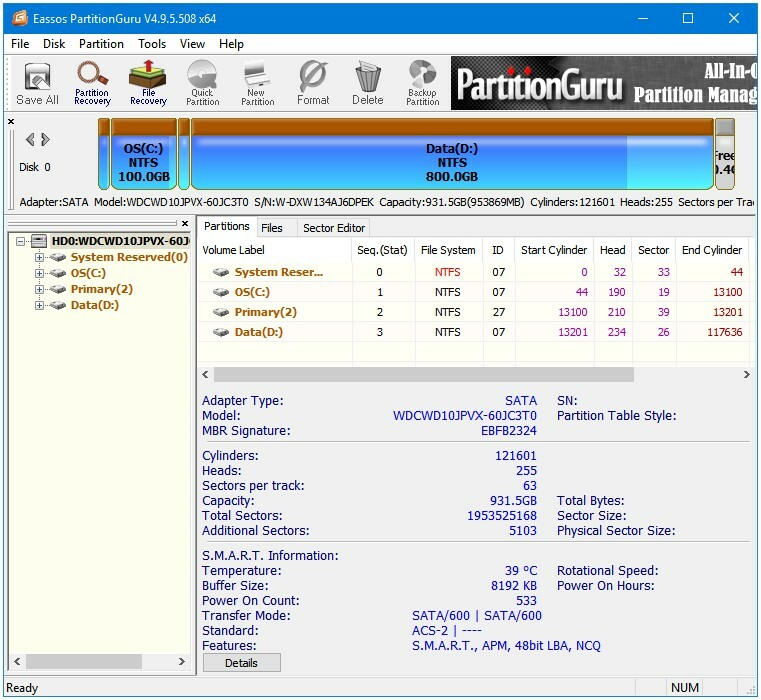 MiniTool Partition Wizard Free Edition lets you use most of the disk and partitioning related functions that they offer. You can perform all of the essential Partition management operations such as Create Partition, Delete Partition, and Format Partition. Other than these, there are many advanced features available as well such as Extend Partition, Merge Partition, and Split Partition. 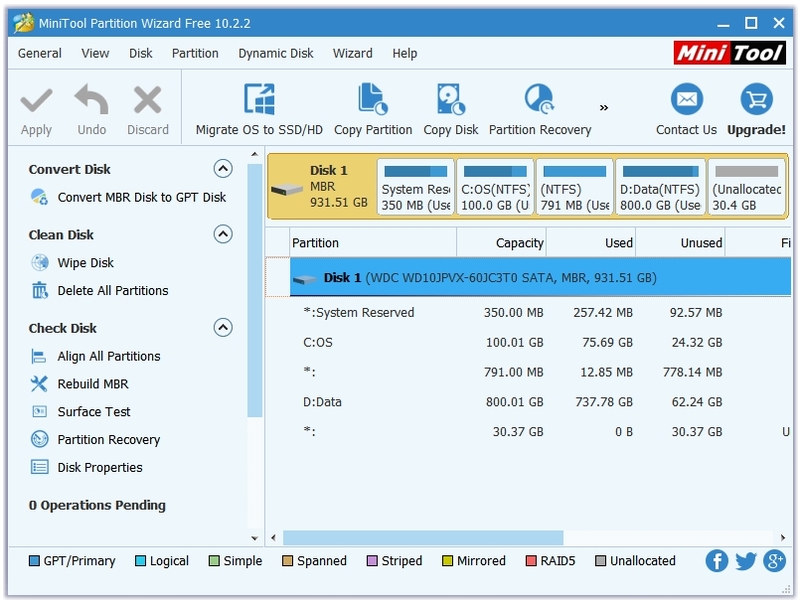 Various wizards are available for users such as Migrate OS to SSD/HDD Wizard, Copy Partition Wizard, Copy Disk Wizard, and Partition Recovery Wizard. The Copy Disk Wizard lets you clone your entire drive, known as Disk Cloning, which removes the need to reinstall the Operating System on the new disk in order to make it boot. You can copy the whole partition as well to make a backup using the Copy Disk Wizard. The Partition Wizard lets you recover accidentally deleted partitions. Additional tools include Align All Partitions, Rebuild MBR, Surface Test, Convert MBR Disk to GPT Disk, Wipe Disk, Hide/Unhide Partition, Set Partition Active, and many more. EaseUS Partition Master Free is not as feature-rich as the above two options but it still has all of the essential disk and partitioning relation functions. The features that can be applied to the whole disk are Clone Disk, Wipe Data, Rebuild MBR, Surface Test, and Convert to Dynamic Disk. Features available for partitions are Resize/Move Partition, Clone Partition, Merge Partitions, Delete Partition, Format Partition, Wipe Partition, Check Partition, Hide Partition, Change Label, Change Drive Letter, and Convert to Logical. Features available for unallocated or deleted partitions are Create Partition, Wipe Data, Partition Recovery, and Properties. Along with all of these Partition management features, this program also has a dedicated disk Cleanup and Optimization section, which has these three tools – Junk Files Cleaner, Large File Cleanup, and Disk Optimization. Junk Files Cleaner scans and cleans the System, Browser, Windows and other Applications related junk files. Large File Cleanup scans the disk and displays large sized files. Disk Optimization is a defragmentation tool. Under Basic Disk & Partition Management tasks, PartitionGuru Free lets the users Create, Delete, Hide, Format, Resize, and Split Partition. You can Check Partition Table Errors, Rebuild MBR, Clear Reserved Sectors, Verify and Repair Bad Tracks, Mark Active Partition, Edit Partition Parameters, Set Volume Label. It also supports Primary – Logical Conversion, Partition Table Backup and Restore. PartitionGuru is also a Backup & Restore and a Data Recovery software, but the Free version doesn’t give you enough features. You can create an Image file to Backup Partition, and use the same Image file to Restore that Partition. You can use PartitionGuru to Recover the Lost Partitions on your Local Disk. The File Recovery can also be done only on the Local Disk in the Free version. PartitionGuru Free lets you Clone Disk and Partition by Files. This program also includes the Build USB Bootable Disk tool that lets you create a bootable disk of PartitionGuru. You can log into PartitionGuru DOS or WinPE environment to safety implement the changes. Unlike the other four options listed above, this one is a complete Freeware. So, you get all the features that the program has to offer. You can perform all of the essential partitioning related tasks such as Create, Format, Resize, and Delete a Partition or a Logical Drive. This program also lets the user Assign or Change partition attributes such as Drive Letters. You can also mark partitions as Active. 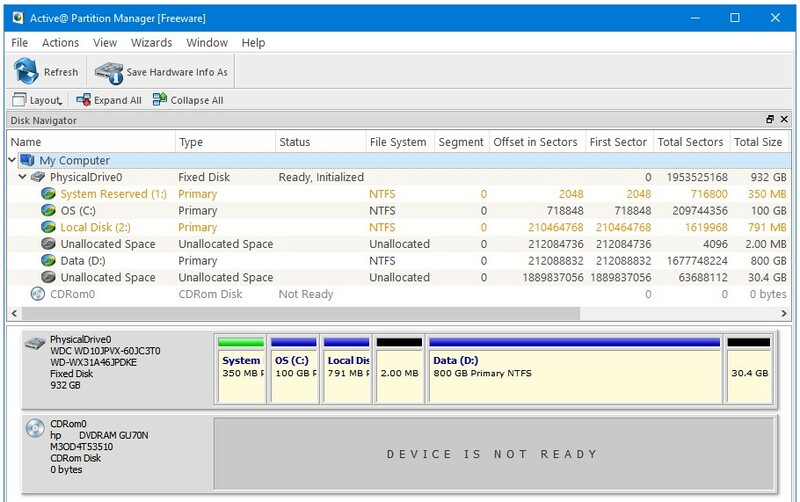 There are several partitioning features for USB disks. Users can create multiple partitions on a USB flash drive. You can format a flash memory device as NTFS. FAT32 partitions of greater than 32GB can be created. You can Convert MBR to GPT or GPT to MBR. There are options to Initialize new disks as MBR or GPT, and fix MBR or GPT on a damaged disk. Another important feature is Rollback partition layout changes, which works in case of Create, Delete, Format partition; you can also Rollback the Disk initialization. GParted stands for GNOME Partition Editor. Search about the best free partition managers, and you’ll always find recommendations about this GNU/Linux-based software. There is no executable (.exe) version of this software so it does not run inside Windows. Windows users neglect it just because of this inconvenience. However, the correct way of managing partitions is outside of Windows, when no Windows or User programs are running as they may interrupt the partitioning process. Running partitioning manager outside of Windows means that there are no problems of comparability with other top-level software such as an Antivirus, which may try to stop the hardware changes involved in configuring partitions. For Windows, GParted can be used inside any of your favourite Linux distribution’s Live USB, or you can just download GParted’s own bootable ISO. Because it doesn’t require an operating system to run (the GParted ISO has its own OS), you can use the GParted’s boot CD/DVD, or USB to partition your brand new disk as well. Unlike other software, GParted had no feature or usage limitation. Very easy to use interface. 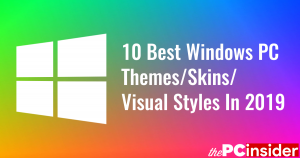 Because it is primarily a GNU/Linux software, and not made for Windows specifically, it lacks many additional features and tools that the other programs in this list have. The Disc Cloning feature is also absent. But that’s not a feature that most of the users use anyway. For general partitioning tasks, this is truly a great software. If you want the cloning feature as well then you can use PartedMagic, which is GNU/Linux-based distro with all of the disk related tools with GParted being the leader. Just like GParted, it also can be booted from a CD/DVD, or a USB, and runs from your RAM.